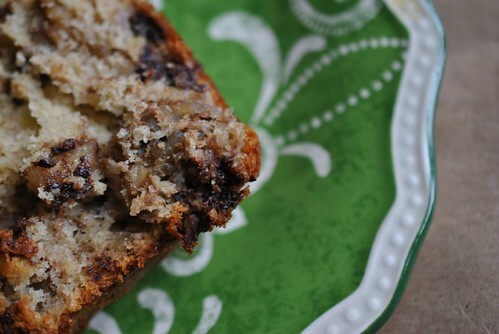 Sharing Pictures Today in the Digital Age…How about over some Spiked Chocolate Banana Bread? In the age of digital photography, what do people do with all the pictures they are taking with their increasingly more fancy/powerful cameras? How many people just take pictures for the sake of taking pictures and then just throw them on a computer? Never to be seen again? How many actually print out pictures? Has posting on facebook become the norm to display pictures to anyone who cares enough to click through them (unlike the living room slide shows of the past)? Before I had this blog, my pictures were shared usually via facebook or just sat on my computer to be used as a screensaver. 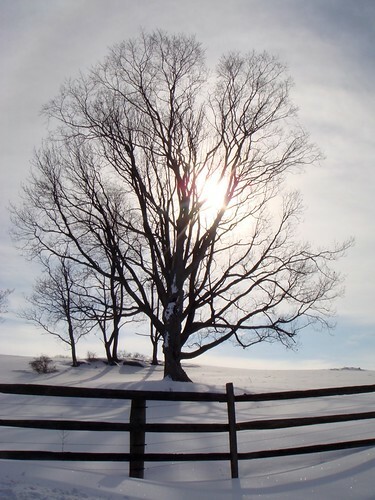 However, with this ability to share pictures with a larger audience, I feel what is lost is that human element. The human element where people sit down together and go through pictures and share the stories behind them. These days when people ask me about trip pictures, I offer to send them a link to the album online even though it just feels so dismissive. Here’s a link, look for yourself. In this day and age where social networking sites allow us to share with a larger (busier) audience, does it make up for the loss of the personal behind the pictures. Is that really better? As I mull that over, let me present to you some banana bread with a little personality. I had some pretty ripe bananas that needed to be used (not unusual here), so I made some banana bread. I actually followed a recipe out of Joy The Baker’s cookbook for Mommom’s chocolate Bourbon-Spiked Banana Bread because I was really curious what a spiked banana bread tasted like. I had no bourbon in the house, nor was I going to run out and buy a bottle for 3 tablespoons worth. I had scotch, but I wasn’t sure if I wanted to crack open the $10 airplane sized bottle I had from Scotland to use as a support ingredient in banana bread. So, I did the next best thing, and just subbed in Kahlua. The Kahlua didn’t add anything to the banana bread at all. It simply isn’t as strong as a good bourbon. When I try this again, I think a good honey bourbon might do the trick. 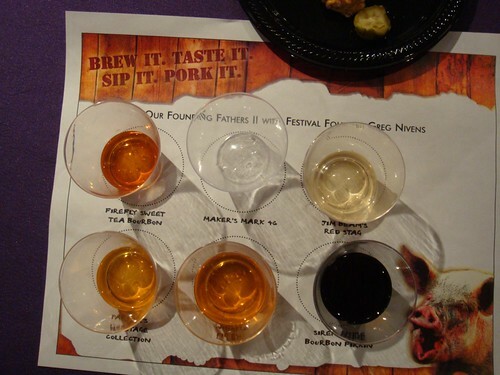 I tried some at a Bourbon, Beer and BBQ festival a couple years ago (where we were lucky enough to snag seats for the Founders Tasting Session), and I remember it being sweeter than all the others I tried that night. Bourbons definitely pack more punch (flavor wise, since 3 tablespoons isn’t going to make the banana bread a boozy one) than Kahlua, so don’t try to sub it out like I did. Tasting mat from the Founders Tasting Session. The Siren Noire Bourbon Firkin (lower right) was my favorite…probably because it was a beer that tasted like chocolate. When greasing and flouring your pan, I really like adding a parchment paper sling. So, butter the pan, then cut out a piece of parchment paper to fit long-way on the pan and overhangs a bit, then butter the paper and flour. It makes taking the loaf out of the pan infinitely easier. Plus it takes away that chance that chunks of bread get stuck to the bottom of the pan when you flip it out later. In a mixer bowl, combine the butter, sugar and beat with the paddle attachment until light and fluffy. Add in the eggs one at a time with about a minute in between each. Stop the mixer and scrape down the sides. Add in the bananas, lemon juice and Kahlua and mix on low until all combined. Stop the mixer and add the dry (flour mix) into the bowl all at once. Mix on slow until just about incorporated. 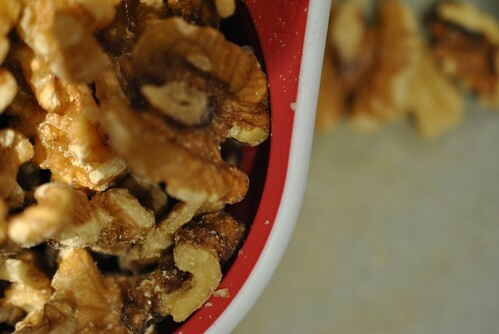 Take the bowl out of the mixer and by hand, stir in the chocolate chips and walnuts. Pour into the prepped pan and into the oven for about 45 min – 1 hour, until a skewer inserted into the middle comes out clean. (mine took an hour, but only because I kind of forgot about it after hitting the timer to stop it from beeping at me). Let it cool in the pan for about 20 minutes before taking it out and letting it cool the rest of the way on a cooling rack. 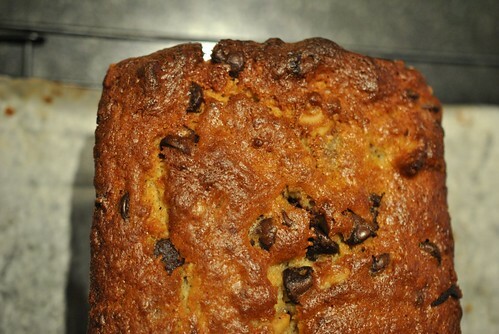 For a banana bread, it was a bit denser, but still very delicious. Since I might have left it in the oven just a touch too long, the top crisped up very nicely and was pleasantly crunchy, but not in a bad way. Like I said, I felt like there was just too much chocolate chip in it. I would be really interested in doing this again, except with real bourbon instead of just Kahlua. However, that being said, if you don’t want any spirits in it, I think it would be okay to just sub in some vanilla extract. Going back to the picture issue. Inspired by a recent Secret Santa gift given to a fellow WBC member, I decided to make a calendar with some select images that have been posted here on ChezSylvia. I’m actually really excited about it and looking forward to putting it up in my cubicle at work (I think after 3 years, I should start making my cube look a little more personal). I’ll have to share with you guys when I get it! 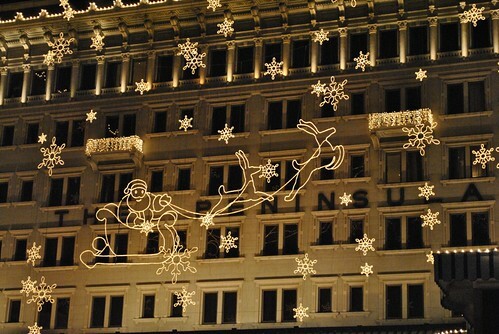 Christmas Lights outside the Peninsula Hotel, Hong Kong. This entry was posted in Bread, Dessert, Uncategorized and tagged Banana Bread, Bourbon, Digital Photographs, Sharing, Social Networking. Bookmark the permalink. 6 Responses to Sharing Pictures Today in the Digital Age…How about over some Spiked Chocolate Banana Bread? Merry Christmas Sylvia!! I going have my homemade marshmellows in my hot coco today after my stupid pregnancy glucose test!! Miss you! Miss you too! Leeroy isn’t as fun to run and chat with 🙂 I hope you enjoy the marshmallows and cookies! Merry Christmas to you and the crew! OOh…I’ll have to try mini chips. That would make it a nicer balance. Thanks! Ugh… I hate when I don’t have an ingredient for a recipe. Especially something that you would be able to taste the difference in! !